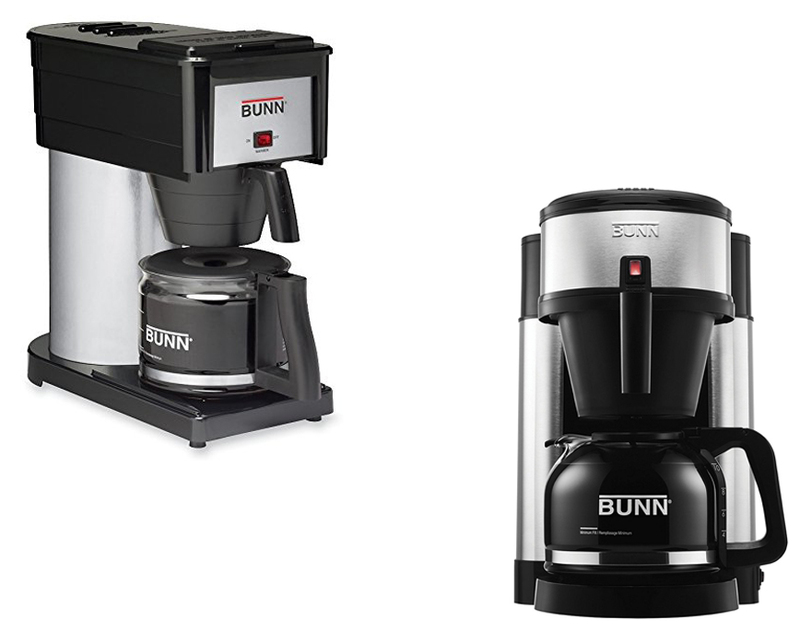 Bunn BXB and NHS are two popular coffee brewing system from Bunn. Both machines offer the same capability as well as simplicity. Their lack of controls works well for people who prefer their coffee to be simple without much customization. Both brewers are equally great and it is only a matter of taste when choosing both. Bunn BXB is a home brewer system from the same name manufacturer. This company is specializing their activity on making dispensed beverage equipment, such as coffee or tea. Bunn BXB is one among Bunn other coffee brewer system available. The brand itself has been around for quite some times since 1950s, so it is not strange that this brand is famous among older people. This machine comes with a promise of making your coffee faster and durable enough for everyday use. When you look at the machine from the outside, this machine appearance has the typically Spartan look of Bunn machines. The complete measurements of the machine is 7.1 x 13.8 x 14.3 inches and weighing a round 8.6 pounds. It is not small but not too bulky either and even the unit look heavy it still can be move around easily. The body is made with a combination of plastic and stainless steel on some parts. The carafe it comes with is made of glass with plastic handle. 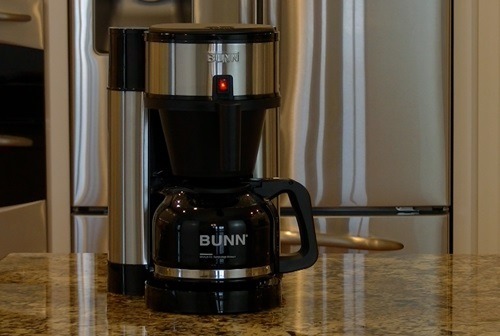 Taken from toptenreviews, Bunn BXB is boasting its speed among others features, since it can give you around 10 cups of coffee liquid in under three minutes, which is pretty fast compared to many other similar machines out there that may takes up 10 to 15 minutes to give you the same amount. This is why it is perfect for people who often drink coffee in their daily life. Inside the machine there is a thermostat to maintain the water temperature in its stainless steel water tank, so you can make your coffee faster anytime as well as help keeping your brew to taste great. To brew your coffee, Bunn BXB is using a spray head to deliver you a maximum wetting and flavor extraction of your ground of choice. When you use the machine makes sure to use the Bunn coffee filters since they are tall enough to contain your grounds in the basket and prevent them from overflowing. What is the most important on this machine is the lack of control, which is seen as a plus and minus by different people. The lack of control will surely fasten the brewing process, since you don’t have to adjust many things to get a nice brew and is perfect for older people who already hard to keep with new things. However, this lack of feature also seen unfortunate by other people for you can’t make the machine do the brewing according to your taste. If you are not in the mood for a coffee, you can use the machine to produce hot water instead of boiling water in a kettle or pot to make your other favorite beverages, such as tea or hot chocolate. Bunn NHS is a home brewing system by the same name company and one of the brand’s many brewers alongside Bunn BXB we have talked above. Compared to the machine we have talked above, this series is more popular but comes in more affordable price. Similar to any home brewer, the machine boasts its speed in producing coffee with great taste but with shorter time than you brew it manually. For similar brewers, read our article on Ninja Coffee Bar CF091 Vs CF092 here. 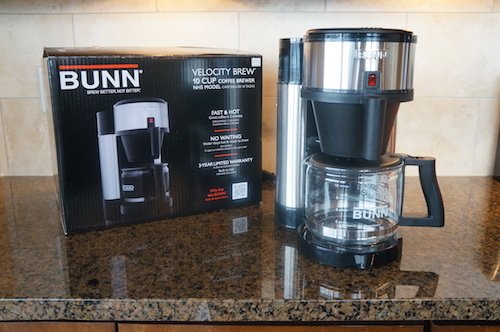 Bunn NHS home brewer system promise you to brew your coffee under three minutes, which is impressive sine you can get around 10 cups of coffee with only one operation. Even though there are many machines out there that can contain more cups in one operation. 10 cups is still a plenty amount of coffee for a regular family. Looking from the outside, you can expect the machine does look like typical Bunn machine with sturdy as well as simple without many details. The material used to build the machine is a combination of plastic and stainless steel in some parts of the machine. The machine have no LCD or many controls but a single switch located at the front top of the unit. The carafe it comes with is made out of glass with plastic handle and measurement. Coming in 11.6 x 13.7 x 9.1 inches and weighing around 8 pounds, Bunn NHS is not too small but it is not too big either. However, for people with small kitchen or apartment, it may look too bulky or too big. As it have been mentioned before, Bunn NHS boast its ability to brew 10 cups of coffee under 3 minutes. With this speed preparing coffee for your family and friends will be simpler and consume less times. Unlike many more expensive brewers, you can make this brewer to keep hot water inside the tank, so you can make other beverages as well. The drip free carafe will minimize the coffee spout to enhance its safety as well as easy to clean. Similar to Bunn BXB, the plus and the minus of the brewer is the simplicity. You will not find any customization in the machine and you don’t have to learn many things before making your first coffee. However, this lack of customization also being the minus of Bunn NHS. The brewer may perfect for people who rarely custom their drink but for people who loves to brew their coffee with the way they prefer, the machine may not seem appealing. Now, let’s compare Bunn BXB with Bunn NHS. After reading our article we are sure, you already know what their difference is. Both brewers have the exact same features, their maximum capacity is 10 cups and comes with minimum customization. Both also have stainless steel water reservoirs as well as the ability to do fast brewing. All in all, the decision is all yours to make. Since both have the same features, you can pick whichever you want. Their difference probably only lay on their design, since both have slightly different head shape. However, we will recommend you Bunn NHS for it comes in more affordable price.